Thesis Presentation: "Men, Women & Angels: Defining a History of Drag Art in America"
Join us for a thesis presentation by art history honors student, Liam Maher. For his presentation, he will present his thesis research from the past academic year, which seeks to contextualize drag performance art circa 1916 to the present. First, he will define his working definition of “drag” as the deconstructing and reassembling of gendered and racial attributes to artistically express one’s sexuality. 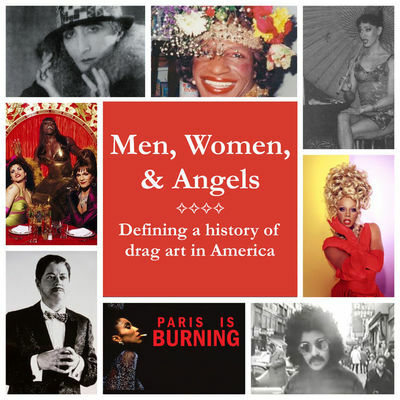 He will then outline the format of his thesis, which distinguishes two “periods” of drag—early drag (1916–1957) and modern drag (1957–present)—and critiques in turn the artistic themes and trends present in each. In conclusion, he will discuss the importance of this research in legitimizing drag art and uncovering a rich narrative of LGBTQ cultural expression previously disregarded in queer historical research.